WASHINGTON — The Obama administration on Friday defended its decision to make a $400 million cash delivery to Iran contingent on the release of American prisoners, saying the payment wasn't ransom because the Islamic Republic would have soon recouped the money one way or another. In a conference call with reporters, senior administration officials said it made no sense not to use the money as leverage to ensure that four U.S. citizens were freed, especially as Washington was uncertain until the very moment their plane left that Iran would live up to its word. The administration's defense came after the State Department outlined for the first time that the Jan. 17 repayment of money from a 1970s Iranian account to buy U.S. military equipment was connected to a U.S.-Iranian prisoner exchange on the same day. Previously, President Barack Obama and other officials had denied any such linkage. The acknowledgement kicked off a torrent of Republican criticism, who declared it evidence of a quid pro quo that undermined America's longstanding opposition to ransom payments. "He denied it was for the hostages, but it was," Republican presidential candidate Donald Trump said in a speech Thursday night in Charlotte, North Carolina. "He said we don't pay ransom, but he did. He lied about the hostages, openly and blatantly." House Speaker Paul Ryan, R-Wis., said Obama "owes the American people a full accounting of his actions and the dangerous precedent he has set." The money came from an account used by the Iranian government to buy American military equipment in the days of the U.S.-backed shah. The equipment was never delivered after the shah's government was overthrown in 1979 and revolutionaries took American hostages at the U.S. Embassy in Tehran. The two sides have wrangled over that account and numerous other financial claims ever since. The Jan. 17 agreement involved the return of the $400 million, plus an additional $1.3 billion in interest, terms that Obama described as favorable compared to what might have been expected from a tribunal set up in The Hague to rule on claims between the two countries. U.S. officials have said they expected an imminent ruling on the claim and settled with Tehran instead. At an Aug. 4 news conference at the Pentagon, Obama said nothing nefarious occurred. "We do not pay ransom for hostages," he said. In a conference call with reporters, two senior administration officials intimately involved with the financial and prisoner negotiations sought to refute what they described as false reports about what happened. They weren't authorized to speak publicly on the matter and demanded anonymity. There was no way that Washington could have avoided repaying the money to Iran in the short-term, one of the officials insisted. The 1981 Algiers Accord between the U.S. and Iran that set up the tribunal made repayment mandatory, and allowed for either claimant to seize assets in international courts if the other reneged on a ruling, the official said. Iran had lived up to its commitment by repaying $2.5 billion awarded for claims by U.S. citizens and companies. A ruling on the military fund was expected soon, the official said, as Iran asked last year for the tribunal to hear its case and Tehran and Washington had been negotiating proposals for a hearing. Given that interest rates in the early years of the fund were as high as 20 percent, the official said Iran stood to receive a much more substantial award than $1.3 billion in interest. As a result, the U.S. opted to settle with Iran. The second American official argued that if there was any quid pro quo, it was the exchange of U.S. and Iranian prisoners. Washington released seven Iranians, mostly dual Iranian-American nationals convicted of sanctions violations, as part of the deal. But even that trade-off faced several difficulties on the busy diplomatic weekend in January that also included the Iranians complying with last year's nuclear accord and the U.S. lifting many oil, trade and banking sanctions on Iran — context, the official said, that played into the administration's decision making with the $400 million. He said the wife of one of the prisoners, Washington Post reporter Jason Rezaian, went "incommunicado" for several hours even though Iran had agreed to allow her to join her husband on the plane. At another point, a prisoner in Virginia who was part of the package refused to accept his pardon, leading Iran to threaten to pull out of the deal. Iran also became miffed when it learned that the prisoners being released in the United States didn't want to travel to Iran, the official said. Iran asked the U.S. to pressure them into leaving, but the American negotiators refused, he said. The various demands led the U.S. to believe there was a possibility the American prisoners would be returned to Iran's notorious Evin prison, the official said. And that is why the U.S. decided to use the settlement money as leverage, the official said. But Friday's explanation, while more detailed than previous tick-tocks of the diplomacy, still didn't answer why the administration insisted for seven months that the money and the prisoners never became part of a common negotiation. 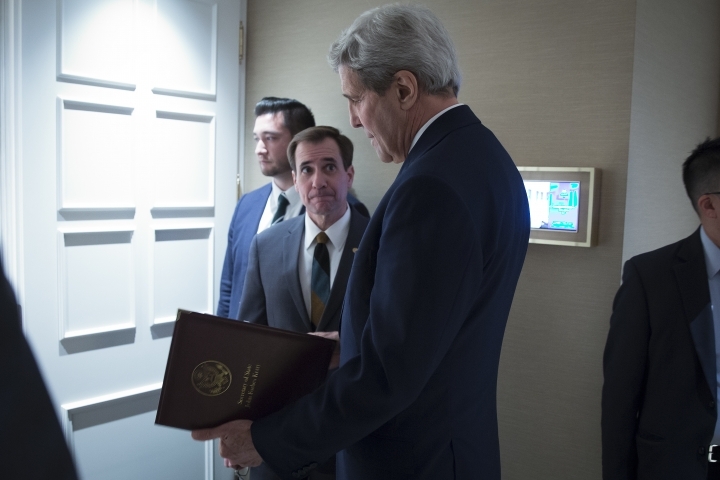 "Reports of link between prisoner release & payment to Iran are completely false," State Department spokesman John Kirby tweeted earlier this month. The explanation is also unlikely to stem the flood of Republican criticism for the changing narrative. Republican Sen. John McCain, himself a prisoner of war in Vietnam, said the administration "paid ransom to the world's number one state sponsor of terrorism and has been trying to deny it ever since."